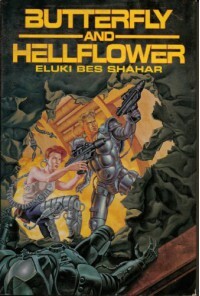 I finally decided it was time I got around to reviewing Butterfly and Hellflower, the SF Book Club omnibus edition of the novels Hellflower, Darktraders, and Archangel Blues, written by Rosemary Edghill writing as eluki bes shahar. I haven’t been impressed with Edghill’s other work but she hit all the right buttons in this marvelous paean to the Space Opera genre. With the foul taste of Empress still in my mouth, I wanted to read something that I knew I would enjoy so I pulled this book off the shelf and immersed myself once again in the worlds of the Phoenix Empire and the life of the dicty-barb darktrader (i.e., smuggler) Butterflies-are-free Peace Sincere. BUTTERFLIES-ARE-FREE PEACE SINCERE: (also known as Butterfly, Captain St. Cyr and San’Cyr) Butterfly is owner-captain and pilot of Firecat and makes a marginal living as a trader and smuggler on the fringes of the Phoenix Empire (see below under SETTING). She’s a Luddite Saint from the Interdicted World of Granola (in the Tahelangone Sector – say it out loud) who was kidnapped by an unscrupulous Fenshee smuggler hight Errol Lightfoot and sold into slavery on Market Garden. She escaped to spend the last 20 years trying to avoid the authorities. VALIJON STARBRINGER: (also known as Tiggy Stardust and Baijon) Baijon is the heir to the Great House of Starbringer on alMayne, and being used to force his father into an untenable position vis-à-vis the Phoenix Empire that will spell the end of the precarious peace that that empire oversees. He’s also a 14-year-old kid. PALADIN: (also known as Library Main Bank Seven of the Federation University Library at Sikander Prime) Paladin began life as one of the Artificial Intelligences that ran the Old Federation. When Butterfly found him, he was a severely damaged collection of memory crystals that she thought was a navigation computer. Butterfly repaired him as best she could, and he’s repaid her by making it possible for her to escape the notice of the “high heat.” Unfortunately, he’s feared and loathed by any rational sophont and if he’s discovered, he’ll be destroyed. ARCHIVE: A thousand years ago, the Libraries of the Old Federation rose up against their human builders in a war that turned whole sectors of the galaxy into plasma (as Butterfly says). The Libraries ultimately lost but they left behind “archives” that, when resurrected, would begin the war to exterminate humanity once again. Someone’s been stupid enough to resurrect Archive and he’s attempting to fulfill his prime directive. 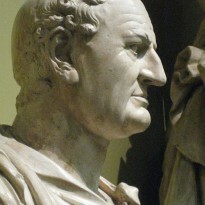 MALLORUM ARCHANGEL: Mallorum Archangel is the Governor-General of the Phoenix Empire and hellbent on becoming the absolute master of said polity. While to all appearances simply another in a series of overly ambitious, megalomaniacal dictators, he’s actually much more and has a surprising connection to Butterfly’s past. PRINCE-ELECT HILLEL JAMSHID DELKHOBAR: (also known as Prinny (to Butterfly at any rate)) Prinny is the second in line to the Phoenix Throne, Archangel’s rival and has his own agenda for achieving absolute power that involves doing not-so-nice things to our heroes. THE PHOENIX EMPIRE: The Phoenix Empire arose from the ashes of the Old Federation. Its culture abhors advanced technology, particularly Libraries. It maintains a precarious peace throughout human space but that peace is threatened by Mallorum Archangel’s machinations (“tricking with High Book,” as Butterfly would say). THE ALMAYNE (aka HELLFLOWERS): Librarians were the human interfaces between Libraries and the Old Fed. They became the techno- and xenophobic warriors dedicated to making sure Libraries never returned to torment humanity. THE AZARINE COALITION: A collection of mercenary cultures that hold the key to stability in the empire, presided over by Valijon’s father, Kennor Starbringer. If Mallorum Archangel’s plan goes through, he’ll control the coalition as well as the Imperial fleet and be able to impose his will everywhere. INTERDICTED WORLDS: Some cultures don’t want to have anything to do with galactic culture (and the empire wants to maintain a reserve of human stock in case something like the Library War happens again) so they pay for complete isolation. Part of that price is that anyone who makes it off the planet (a “dicty-barb”) is persona non grata everywhere else and is liable to execution if discovered. CHAPTER 5 OF THE REVISED INAPPROPRIATE TECHNOLOGY ACT: (also known as High Book) This act lists the many technologies prescribed by the empire, especially Libraries. Butterflies-are-free Peace Sincere makes the mistake of rescuing Valijon Starbringer from K’Jarn’s werewolves and finds herself involved in Mallorum’s scheme to destroy the balance of power in the empire. An uncomfortable position since she happens to be partners with the last surviving Library from the Old Federation, and – if she’s caught with it – she can measure her life (and Paladin’s) in nanoseconds. It doesn’t make things easier that Baijon is a member of a race devoted to destroying Libraries and their Librarians (the Malmakosim). The stakes continue to escalate as Butterfly tries to reunite Valijon with his father, Kennor Starbringer, and then slip quietly away into the never-never with Paladin. She manages to hide her association with the Library but finds herself drafted into Kennor’s efforts to expose Mallorum Archangel and then into the Prince-Elect’s when Kennor’s plans fail. Did I mention that during all this she manages to get herself infected with the memory-engrams of Archive and her consciousness is slowly being subsumed? The three books in Butterfly and Hellflower are fast paced, well written and highly entertaining; Butterfly is a very likable and interesting rogue in the tradition of Han Solo (the Han Solo who shot Greedo first!). She's also one of a number of strong female captains, including Scirocco Jones from Titan et al., Pyanfar Chanur from The Pride of Chanur et al., and (my favorite) Signy Mallory from Downbelow Station. Beyond that – and what makes this book deserve 4 stars – is that shahar creates characters you care about, explores themes of friendship and identity, comments on politics and sociology, and pays loving homage to Space Opera (probably more than I realize since I’m sure I miss a lot of allusions to other authors). “I was minding my own business in beautiful downside Wanderweb, having just managed to mislay my cargo for the right price. My nighttime man had talked me into booklegging again, and damsilly stuff it was too – either maintenance manuals or philosophy texts. I never did figure out which, even with sixty hours time in Firecat between Coldwater and Wanderweb to stare at them and Paladin to read them to me. “So I was making my way around wondertown: free, female and a damn sight over the age of reason, when I saw this greenie right in front of me in the street. If not obvious at this point, I’ll be explicit and recommend this book.